One twisting road in, one twisting road out. But what ended up truly twisted were our minds. How on Earth could a place so incredible exist? The mountain villages of New Zealand’s Southern Alps were tough to leave. There isÂ the hip town of Wanaka that seems to be Queenstown’s little brother. Less people, but just as exciting. Not to mention you can rediscover your youth and imagination at Puzzle World. The Great Maze is 1.5 kilometers long and the average undertaking requires three times that distance. We were average on this day. 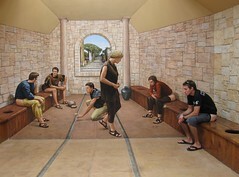 The room of illusions made our brains ache. Lake Hawea’s shores were passed en route to Queenstown, the sensational adventure capital. Jet boating, zorbing, bungy, sky diving, white water rafting… all yours if credit card debt is not intimidating. Our most cherished campsite was a 45 minute drive outside Queenstown on Lake Moke. While not the easiest place to find, perhaps that is what makes this gem unspoiled. 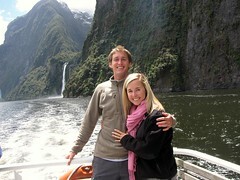 Alas, we tore ourselves away and motored to the famed Milford Sound. Already overwhelmed with the incredible beauty rushing past Bazils as we navigated New Zealand’s twisting roadways, we were unprepared for imminent sensory overload. Without a shadow of a doubt,Â the two lane highwayÂ leading to/from Milford Sound is the South Island’s most scenic drive. Pull over, initiate hazard lights, scan the vista, tip nose up like a mutt, inhale sweet aromatic smells, take mental snapshots. Rinse, repeat… 35+ times. 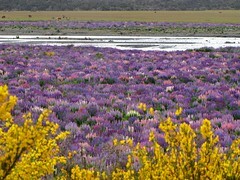 A rambling mountain creek seemingly followed us for hours, its shores surrounded by magnificent purple flower blooms. When the creek abandoned us, a rushing river of white foam accompanied us with evergreen trees standing tall. Then the pristine forest was relieved by a marsh that reflected the snow capped peaks. Then fog enveloped us and small droplets appeared on the windshield. Rats! Rain nor menacing clouds could ruin the experience. Rather, Mother Nature was simply flexing her muscles and turned an already stunning canvas into a masterpiece. Mountaintops choking in dense fog and countless waterfalls appearing from the heavens. Ash and I took turns hollering, â€œholy smokes, oooh check that out, whoa.â€ All five senses working overtime. Next we came to a tunnel that resembled the entrance to a bomb shelter and after ten minutes the signal invited us in for a look. Though the tunnel was a bit unnerving due to lack of lighting and heaps of moisture, the darkness made the exit that more dramatic. Here we were, surrounded on all four sides with sheer cliffs of rock topped with ancient snow. How much more of this can we take? Caught up in the drive itself, we nearly forgot our intended destination. 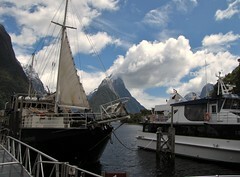 Pulling into the main parking lot of Milford Sound, our eyes pulsated. The combination of late afternoon light, fog, and blackishÂ water created a moment neither of us will ever forget. Mountains jutting out from watery depths, waterfalls providing background noise, the air a mix of recent rain and the sea. After learning the only campground in Milford Sound was full, we gladly settled in along the shore for the night. Who cares we smelled like yetis. By morning the battle between sunshine and clouds was settled. Rays of light appeared abundant making Milford Sound look wholly different under mostly sunny skies. It was hard to decide which we preferred: veil of mysterious clouds or sunkissed vistas? Regardless, we boarded a seaworthy vessel and floated in a place once occupied by glaciers. Seeing large boats dwarfed by waterfalls and mountains emphasized the enormity of our surroundings. Hugging the southern coast of the sound, the mixture of the dark sea, cascading water, and towering mountains was mesmerizing. At one point, as I was running around the boat acting like a National Geographic photographer, my eyes met Ashley’s and our mutual wonderment was recognized. 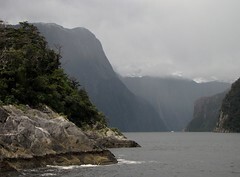 Slowly, the width of Milford Sound grew larger and the Tasman Sea appeared. The whitecaps cresting in the open ocean reminded us of the protection provided by the snow covered mountains on either side. 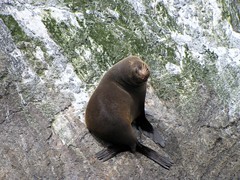 Now moving along the northern coastline and back towards the boat slip, numerous seals contended for prime sunbathing space on the odd boulder. 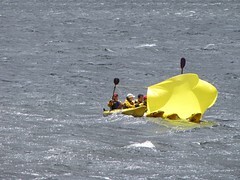 Passing waterfall after crashing waterfall, four kayakers overflowing with ingenuity had fashioned a downwind sail out of a yellow tarp tied to their oars. The boat captain skillfully maneuvered the vessel into port with the paying customers exhibiting faces of a recent religious experience. Milford Sounds is that enchanting. Morning brought even more sunshine the next day and short hikes allowed elevated views of nature’s beauty. The tide had moved out, which provided the opportunity to explore the sound’s seabed of round stones covered in slick green moss. 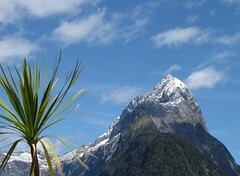 From this vantage point, Mitre Peak stood proudly among the other towering peaks. 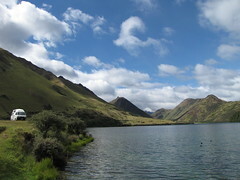 The chilly water with an Antarctica origin provided a welcome drink and a brisk head shower. One more mental snapshot, one more breath of the mountain/sea air, and one more soundbite of lapping water and the gentle wind. We bid adieu to this wondrous place vowing to someday come back and witness the majesty once more. 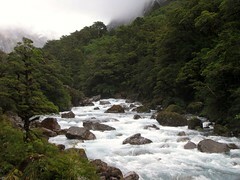 There is exactly one campground in Milford Sound and is booked solid by 9:00 AM everyday. The nearest alternative is one hour in the direction just traveled. Though prohibited, the parking lots fronting Milford Sound are full of campervans. There is no need to retrace your steps because the â€œno overnight parkingâ€ policy is rarely enforced. If a shower is what you are after, the lone campground charges a modest amount to use their facilities. Do yourself a favor and plan ample time for the drive back and forth to Milford Sound. Numerous points of interest like The Chasm and Mirror Lakes are worth a quick hike. Not to mention, you will feel compelled to absorb your surroundings every ten minutes. 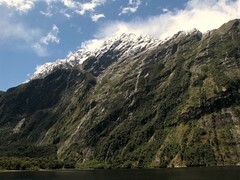 Several Department of Conservation campsites can be found about one hour outside Milford Sound. These are among the most scenic and remote. 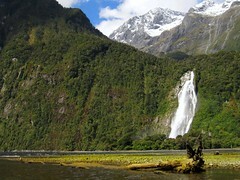 From these campsites, it is possible to take day trips to Milford Sound and avoid the crowds. Guys – most excellent pics! Truly spectacular. Hope your volunteering is the beginning to an incredible month for you both. Fernet – The photography is coming along. 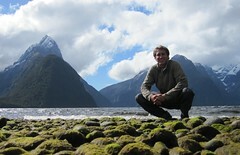 The unmistakable beauty of Milford Sound is hard to miss through any digital camera. The Palm Tree Orphanage is a magical place… the kids are spectacular.